Man compares the newly-created object  – for example, the relief, the fresco – with natural objects. If, for example, in a relief, the animal in front covers a part of the animal behind, this does not mean that that part has ceased to exist, but that there is a distance, space, existing between these two bodies. The space of the plane developing into view lengthens and widens, increases to a new system, which finds its expression in perspective. 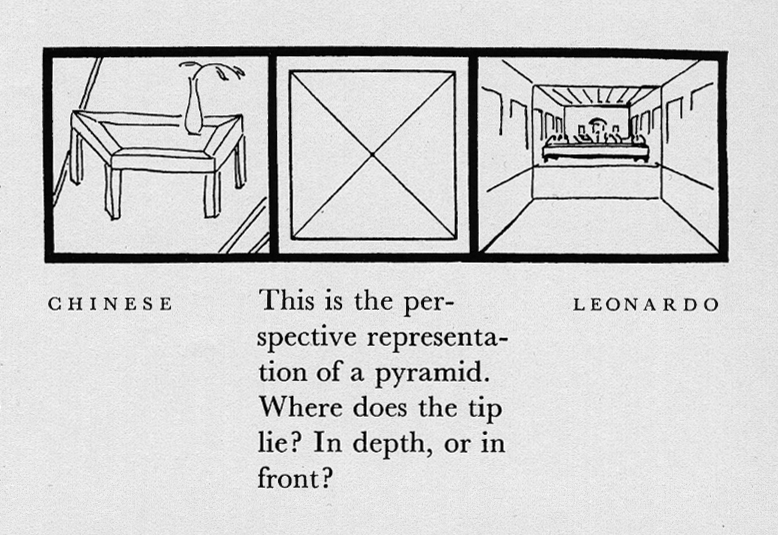 It is generally accepted that perspective representation is the clear, objective, obvious way to represent space. 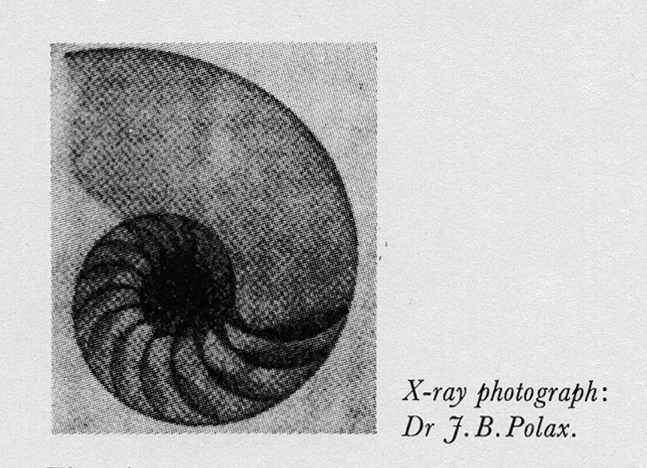 It is said that, after all, the camera also works perspectivally and at the same time one is forgetting that the Chinese once built the object-lens with concave instead of convex lenses as we have, and so would also have produced an objective and mechanical image of the world, yet quite a different one. Perspective has comprehended space according to the concept of Euclidean geometry as a constant three-dimensional state. It has fitted the world into a cube, which it has transformed in such a way that in the plane it appears as a pyramid. The tip of this visual pyramid either lies in our eyes – therefore in front of the object – or we project it on to the horizon – behind the object. The former concept was chosen by the East, the latter by the West. Perspective defined space and made it finite, then enclosed it; but the ‘universal set’  of art became richer. Planimetric space provided us with the arithmetical progression. There the objects stood in the relation: 1, 2, 3, 4, 5 … In perspective space we acquired a new geometric progression; here the objects stand in a relation: 1, 2, 4, 8, 16, 32 … Up to the present time the ‘universal set’ of A. has acquired no new enrichment. In the meantime science undertook fundamental reconstructions. The geocentric Ptolemaic conception of the universe was replaced by the heliocentric system of Copernicus. The Euclidean conception of fixed space was destroyed by Lobatschewski, Gauss and Riemann. The impressionists were the first to begin exploding the hereditary notion of perspectival space. The cubist method was more decisive. They transposed the space-confining horizon to the foreground and identified it with the area being painted. They made improvements to this fixed area through psychic features (walls covered with wallpaper and so on) and by destroying some elementary forms. They built from the perspective plane forward into space. The latest sequels are: the reliefs by Picasso and contre reliefs by Tatlin. Our arithmetical notation, which is called the positional system, has long used the 0, but it was not until the sixteenth century that the 0 was first regarded as a number, as a numerical reality, and no longer as nothing (Cardano, Taraglia). It is only now in the twentieth century that the ☐ is being acknowledged as a plastic value, as 0 in the complex body of A. The solidly coloured ☐ stamped out in rich tone on a white surface has now started to form a new space. New optical discoveries have taught us that two areas of different intensities, even when they are lying in one plane, are grasped by the mind as being at different distances from the eye. In this space the distances are measured only by the intensity and the position of the strictly-defined colour-areas. The space is arranged in the simplest directions – vertical, horizontal, or diagonal. It is a positional system. These distances cannot be measured by any finite measure, as can the objects in planimetric or perspectival space. The distances are irrational; they cannot be represented as a determinate ratio of two whole numbers. An example of irrationality is the ratio of the diagonal of a square to its side: this is √2 = 1.4, or more exactly 1.41, or still more precisely 1.414, and so on, always more and more accurately, ad infinitum. Suprematism has advanced the ultimate tip of the visual pyramid of perspective into infinity. It has broken through the ‘blue lampshade of the firmament’. For the colour of space, it has taken not the single blue ray of the spectrum, but the whole unity – the white. 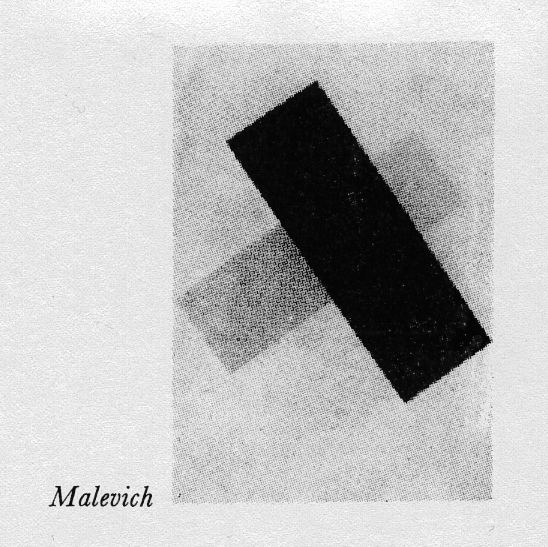 Suprematist space may be formed not only forward from the plane but also backward in depth. If we indicate the flat surface of the picture as 0, we can describe the direction in depth by – (negative) and the forward direction by+ (positive), or the other way round. We see that suprematism has swept away from the plane the illusions of two-dimensional planimetric space, the illusions of three-dimensional perspective space, and has created the ultimate illusion of irrational space, with its infinite extensibility into the background and foreground. This is where we first arrive at an A. complex, with which we can compare the mathematical analogy of the unbroken line, which comprises within itself the natural numerical progression, with whole numbers and fractions, the 0, the negative and positive numbers, and the irrational numbers. However, that is still not all. Mathematics has created a ‘new thing’, the imaginary numbers.By this is understood a number which, when multiplied by itself, results in a negative quantity. The square-root of minus one is the imaginary thing i ( √-1=i). We reach a sphere which is beyond comprehension, which derives from purely logical construction, which is an elementary crystallization of human thought. What has this to do with the perspicuity, with the sensuous comprehensibility of A.? In the vital urgency for expansion of A. and of F., some modern A.ists, some of my friends, are thinking of building new, multi-dimensional, real spaces, into which one can go for a walk without an umbrella, and where space and time are interchangeable, are brought into one unity. In this they have based their ideas, in a flexible, superficial way, on the most modern scientific theories, without acquiring any knowledge of them (multidimensional spaces, the theory of relativity, the universe of Minkovsky, and so on). But artists who are producing something may be permitted all their theories, provided their work is positive. Up to the present time the only positive thing in our field of activity has been the direction of the expansion; but thanks to the attractions of scientific theories being incorrectly grasped, the work itself is still inadequate. It is not only for plastic F. that the pioneer constructions of the new mathematical world have their attraction. Lobatschewski has already exploded the absoluteness of Euclidean space. Euclid had worked out, from knowledge of terrestrial dimensions, a mathematical conception of space which takes no cognizance of curvature, consequently it is capable of building a square on a plane which may be measured by an invariable standard. Correspondingly, a cube can be established on this square. Lobatschewski and Gauss were the first to prove that Euclidean space is only one instance in the unending succession of spaces. Our minds are incapable of visualizing this, but that is precisely the characteristic of mathematics – that it is independent of our powers of visualization. Hence it follows that the multi-dimensional spaces existing mathematically cannot be conceived, cannot be represented, and indeed cannot be materialized. We can change only the form of our physical space, but not its structure, its three-dimensional property. We cannot really alter the measure of curvature in our space; that is to say, we cannot transform the square and the cube into any other stable form. Only the fata morgana can simulate this. The theory of relativity offered proof that the measurements of space and time are subject to the motion of the systems in question. According to this theory a person can die before he was even conceived. This example runs in reverse sequence to our way of thinking, and this being so we must follow the laws of our natural philosophy, in order to construct A.istic F.’s which produce an effect on us through the apparatus of our senses. Time now becomes a factor of prime consideration as a new constituent of plastic F. In the studios of modern artists it is believed that space and time can be formed into a direct unity, and therefore that they can replace each other. Space and time are different in kind. Space in our physical science is three-dimensional. In time, however, one cannot wander into depth, height, breadth; time is one-dimensional. We differentiate between three-dimensional, physical space and the multi-dimensional mathematical spaces. There is but one time, both in physics and in mathematics. We know no space outside of objects and no objects outside of space. To form space means to form objects. Objects can be resolved into elements. Time is constant, it cannot be decomposed into elements. Space factors are divergent, time factors are sequential. This we must grasp clearly. Our minds have a certain capacity for comprehension; by technical means we increase that capacity, but for the present this is just a multiplication of data and still not a fundamental change. For example: Our visual space has a frontier, where there are still differences in ocular dimensions but none in ocular distances, where all objects lie at the same visual distance. 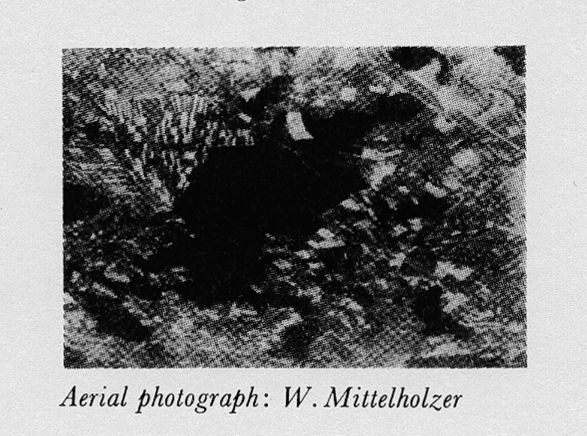 The camera can merely extend the visual space, as is shown by this photograph taken at a height of three thousand metres. Or, we see the transition of curvature from the two-dimensional into the three-dimensional, but the transition of the three-dimensional curvature into the four-dimensional is a factor which neither our sense of sight nor our sense of touch can grasp. Time is apprehended indirectly by our senses; It is indicated by the variation of an object’s position in space. When the speed of these variations had reached that of modern rhythms, artists saw that they were obliged to record this. The Italian futurists have even portrayed the flickering of bodies in their rapid movements back and forth across space. But bodies are set in motion by forces. Suprematism has formed the dynamic tension of these forces. 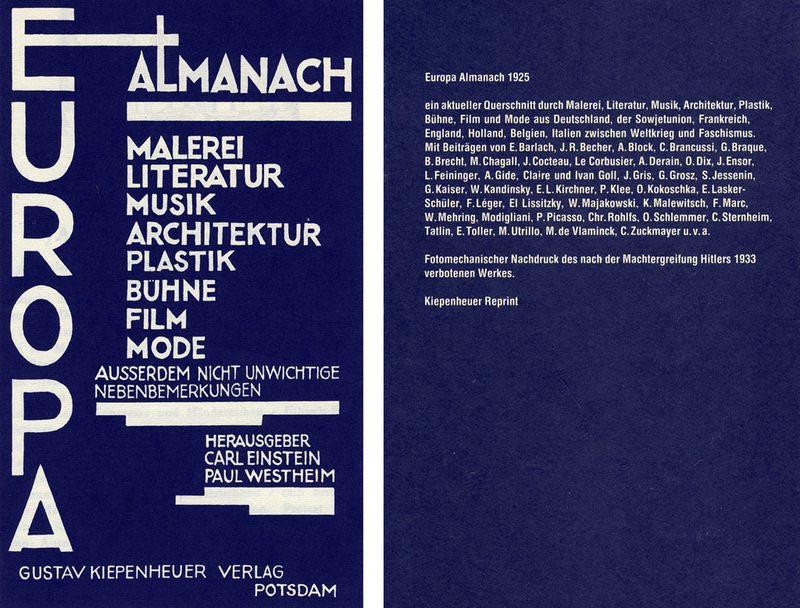 The achievements of the futurists and suprematists are static surfaces which indicate the dynamic (by symbols). These are curve-graphs of speed and dynamism, which have been transposed into the irrational system and made apprehensible. They were not satisfied with this. They wanted to create movement through movement. Boccioni’s solution was a naturalistic style. He connected a part of a sculpture to a motor, so that the organic movement of the body was imitated. Tatlin and the constructivists in Moscow represented movement by means of symbols. The individual bodies in the Monument to the Third International revolve each around its own axis at its own velocity: a year, a month, a day. In 1921 Pruzakov constructed a mobile relief which, with a dadaistic touch, symbolized or caricatured a factory-committee in session. Gabo stylized the pendulum-movement of a metronome (Russian Art Exhibition, Berlin 1922). The only important achievement was that of the modern dynamic advertisement, for it was not the product of aesthetic reminiscences but originated from the direct necessity for influencing our psyche. We are standing now at the beginning of a period in which A. is on the one hand degenerating into a pastiche embracing all the monuments in the museums, and on the other hand is fighting to create a new expression of space. I have shown above that space and object stand in a functional correlation. There now arises the task of forming imaginary space by means of a material object. Our visual faculty is limited when it comes to the conception of movement and indeed of the whole state of the object; for example: disconnected movements separated by periods shorter than 1/ 30 of a second create the impression of a continuous movement. It is on this factor that the film is based. The involvement of the film, as a means of solving the problems of dynamic F. through actual movement, is a decided achievement on the part of V. Eggeling and his successors. That is the first step in the direction leading toward the construction of imaginary space; but the film is only a dematerialized projection of the plane and makes use of only one property of the visual faculty. In these few examples I am using only rotary movement. There are several other kinds of movement which can be used (vibratory, etc.). Here we are not setting ourselves the task of forming motion alone. Motion is incorporated here as an ingredient in the total complex of the elements which are to build the new bodies. The endless diversity of effects which can be realized through giving F. to imaginary space are already to some small extent before us now. It is the use of a whole series of properties belonging to our visual faculty. 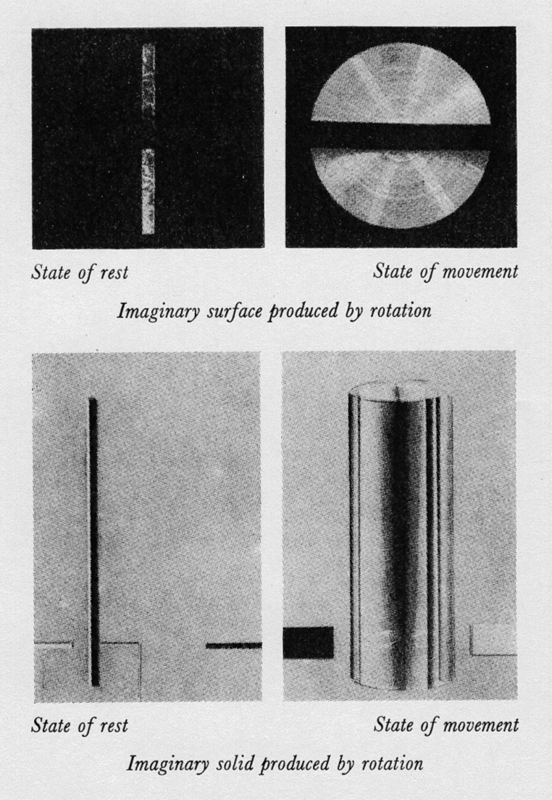 There are the stereoscopic effects produced by movement when it passes coloured media; the colour impressions arising through the superimposition of pencils of rays, through polarization, and so on; the transformation of acoustic phenomena into optical. It can already be foreseen that for our daily needs we shall derive a great deal from this achievement on the part of A. What is particularly important for us, however, is that this A. F. should effect the destruction of the old idea of art, that of ‘monumentality’. The opinion has continued to prevail, even up to the present time, that A. is something which is created for all eternity, which must therefore be indestructible, heavy, massive, hewn in granite, cast in bronze. 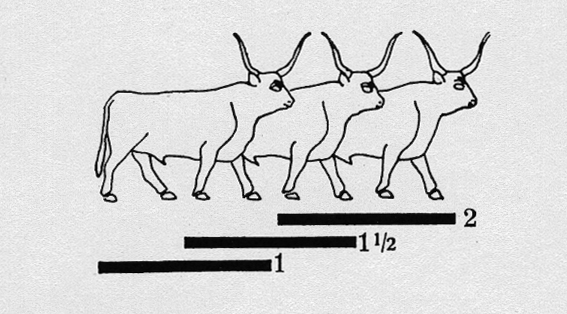 The Pyramid of Cheops. The Eiffel Tower is not monumental, for it was not built to last for ever, but as an attraction for a World’s Fair; it is not a solid unbroken mass, but a tapering column in open construction; here we are citing a work whose total effect is certainly not easy to grasp. But for us monumental does not imply a work which will stand there for a, year or a hundred years or a thousand years, but the perpetual expansion of human achievement. Abbreviations: A. = art, F. = form. The A. object is a product of the union of the natural object with the object to which work is giving reality. (On this subject see section entitled ‘The A. object’). It was central perspective that was employed and developed for the most part during the Renaissance period; it represented the cube with one side placed parallel to our face. It is a spectator’s view of the façade, the depth of a stage; it was for that reason that perspective became so implicated in scenography. By ‘universal set’ is understood the totality of all possible numbers; this may be represented geometrically by a straight line consisting of an infinite number of contiguous points. Mondrian’s solution is the ultimate achievement in the development of Western European painting. He brings the plane back to its original condition, to utter flatness; there is no longer any suggestion of receding back into or proceeding out from the flat surface. It is the ultimate in confinement within the plane. When the De Stijl A.ists transpose the Mondrian principle to the three planes of space, they become interior decorators.